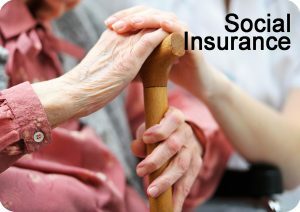 The Social Insurance Scheme under the Ministry of Labour and Social Insurance (MLSI) provides monetary benefits for retirement, illness, disability, old age, marriage, maternity, orphanhood, unemployment, widowhood, death and employment injury. Cyprus citizens and anyone legally employed in Cyprus are eligible for this. EU citizens who are pensioners/retirees are also eligible. Those who want to continue coverage after a period of mandatory contributions (Voluntary Contributors) may opt to do so; all others must obtain private pensions and insurance. The Cypriot social security system provides benefits and pensions. It is financed by employee, employer and state contributions. Under the social security system, recipients are entitled to subsidised state health and dental care. Payments are made to the District Offices of the Department. Social insurance payments can also be made via the internet. To register for online payments, complete and return the application form payment of contributions over the internet (PDF in Greek). Once registered, a code will be issued so that payments can be made via the online Social Insurance contribution payment system.